On Sunday, December 4th, the second Sunday of Advent, the families, lay members and youth of the Home of the Mother from Lumezzane, went on a “mini-pilgrimage” to the birth place of St. John XXIII, Sotto il Monte in Bergamo. 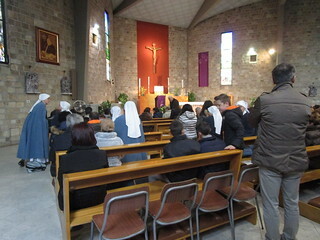 Once we arrived there, members of the Home of the Mother from Brignano Ger d´Adda met up with us, thus completing the group. We began our mini pilgrimage by going to mass at 11:00 am at the Headquarters of the PIME (Pontifical Institute for Foreign Missions), which is located in the same place where St. John XXIII was born. It was precisely this Pope, with his great missionary impulse, who wanted that the headquarters for the PIME be in this place. Afterwards, thanks to the hospitality of this institute, we were all able to eat together in a room that they let us use. The afternoon was very intense as we got to know this wonderful pope who is already canonized. We began by visiting the house where he was born; there we were able to see many pictures, family mementos, vestments that he used and personal objects that belonged to him, etc. There at the institute there is a multimedia room where they project videos that go throughout the whole life of the pope. The youngest children and the oldest person of the group thoroughly enjoyed themselves and we all discovered many new things about this saint. 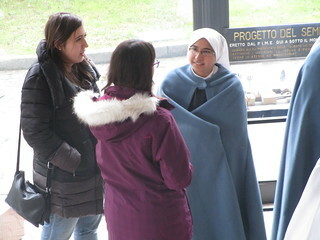 From there, the group went to the Pope’s summer house where the Sisters of the “Poverrelle”, an Italian order that took care of the Patriarch of Venice, now take care of a museum that they have there. They welcomed us very amiably and they gave us a tour of the museum. We discovered many anecdotes and spiritual experiences that the pope had at that very place. All of this helped us feel that he was very close to us and we commended ourselves to him and asked for his intercession. So, with our hearts full of joy and spiritually uplifted because of all we had lived during the day, we returned to our homes. Thank you St. John XXIII. Pray for us!